The front of “Maison du Coq,” our abode. On our first morning in Bamako our driver was coming to pick us up at 9 sharp, so we awoke a couple of hours early to get a good look at everything in the light. I mean who knows, there could be a leper colony next door, or cat-sized spiders crawling on the ceiling. Thankfully the bright sunlight revealed no lepers or spiders, just our rooster and cats. 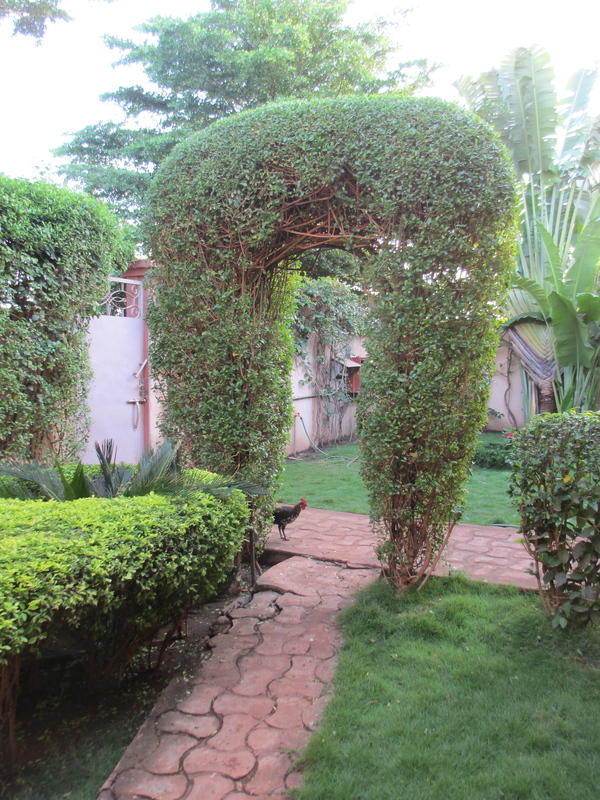 View of our garden and our hoarse rooster, who is still skeptical of our motives. From the roof deck, that watery orange road alongside our house just glowed like a painting by Thomas Kinkade, painter of light. A boy walked along the road, and his white robe was blowing so perfectly in the breeze that I thought this wasn’t real. Behind him were several girls in green and yellow and orange robes who balanced various things on their head. It all made for a scene out of a foreign film, and boy do I hope I continue to appreciate simple things like this as time goes on. Person 1: Ça va bien? Person 2: Ça va bien. Caroline took us through the school where we met the staff (who also already knew our names). Apparently we are rock stars because, unlike the other 5 new hires, we are the only ones who didn’t back out of our contract and showed up. In other words, we were the crazy/committed ones. The school looks great…a real surprise at the end of a very nondescript, bumpy orange clay road. 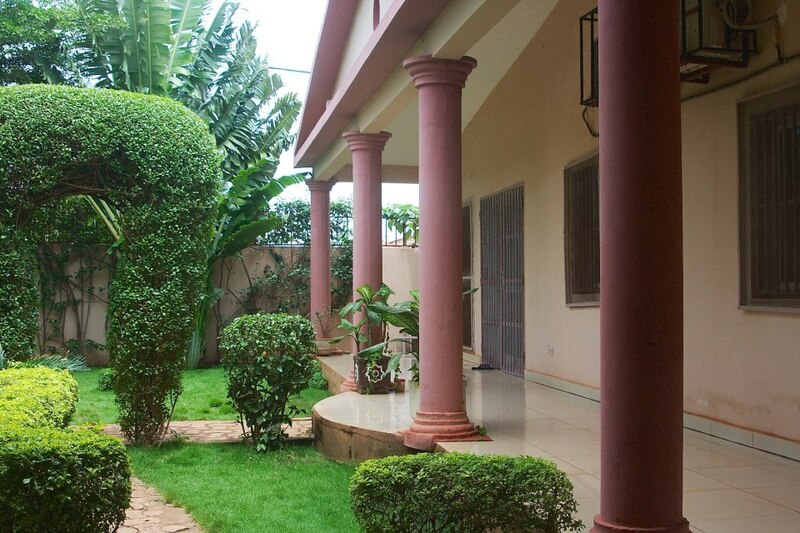 It’s two stories in some parts and has great details like curved towers, intricate stonework, voluminous indoor spaces, courtyards with gardens, a perfect combination of indoor/outdoor connections, and a location right on the Niger River (pronounced knee-zheer). 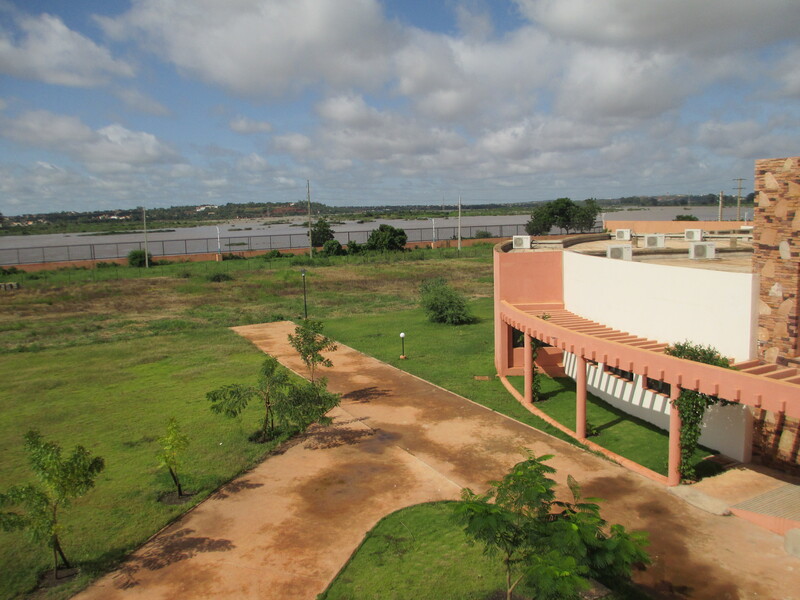 Looking at the Niger River from the school terrace, except I do not have a martini at the moment. There is a large second floor terrace off of the library with sweeping views of the river, and we understand that they hold cocktail parties here for parents. Liquor and education, the perfect pair. Jamey’s classroom is the size of two science labs. It has everything he needs and more—plenty of those lab table thingys, a private safety shower in case students spill chemicals all over themselves, LCD projector, white boards, storage, cool equipment like a distiller, a fume hood, you name it. It opens into a sassy little courtyard full of plants. My 4th/5th combo classroom is just down the hall and is also the largest classroom I’ve ever taught in…again one could do a long tumbling pass right down the center. 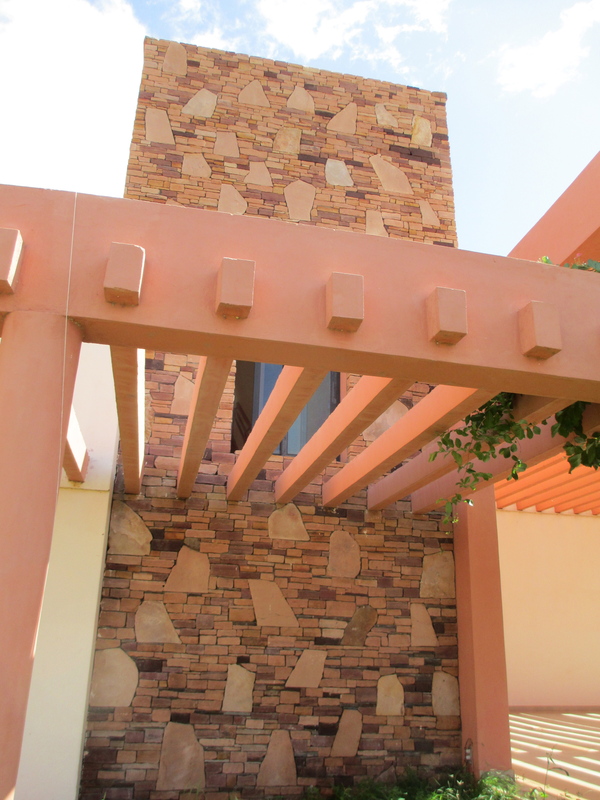 There are windows on 3 sides–one wall is lined with windows looking out onto a terrace, another has a view of the Niger River, and another set look into a planted courtyard. There is an LCD projector, tables (vs. individual desks) for the kids, and tons of furniture to choose from since the school has downsized teachers and students by half since the coup last March…100 kids vs. 200 in pre-K to 12. I have the biggest group of everyone, nine 4th graders and 9 5th graders. It’s so darned big that I’m racking my brain on the interior design and space planning. I could park a car in there and it wouldn’t interfere with anything. Since the school closed unexpectedly in April with the coup, everything was left exactly like it was on April 2nd–stuff still in the student desks, math problems on the board, and a big bar of Godiva chocolate in the teacher’s bottom desk drawer (is it sad that even having been in there for 4 months without AC and with plenty of African critters roaming around, that chocolate bar still looked good to me?). There was also a skinny turd-like thing on the floor, so I don’t know if that’s some exotic lizard excrement or what. It’s really just like an American school was lifted up from the US and dropped down in Bamako. Everything we are used to having, they have–well, except for standardized testing mania, stressed-out teachers, and a government that continues making policies that harm teachers and students. Later Caroline took us on a drive to a couple of supermarches (grocery stores) which were surprisingly like stores in the states and fairly well stocked. They do have odd combinations of items sometimes, like flat screen TVs for sale immediately adjacent to the Pringles (of which they had 12 varieties). Of course most of the products include only French names and descriptions so it’s an adventure deciding if we are buying shampoo, juice, or all-purpose floor cleaner (“lemony fresh” can apply to a lot of products, we have discovered). Paying is fun too since 500 CFAs (their unit of currency, pronounced see-fuhs) equals 1 dollar. So our total for our shopping trip (43,000 cfa) sounded like we had bought a nice car. After shopping Caroline took us to her house in a fancier part of town (just up the block from the former president’s daughter’s home–the one who was chased out in the coup) and it was twice as spacious as ours. She has beautiful art collected from her travels and work around the world (she has worked at international schools in Rome, Zambia, Vietnam, and Bangledesh, and has travelled really everywhere else—including a 7 month overland journey through Africa in the late 80s). She’s having a BBQ Sunday night here for our little faculty of 20, so we look forward to meeting our colleagues. 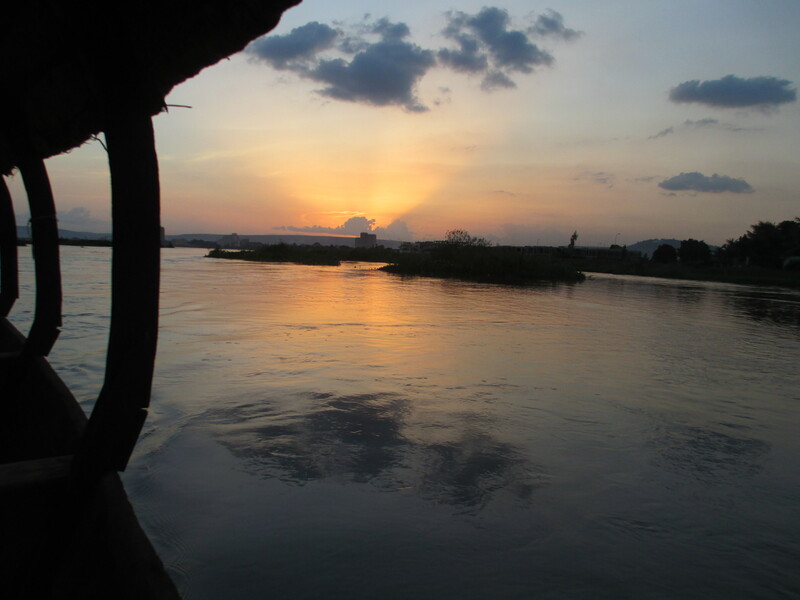 Our sunset canoe cruise on the Niger River. 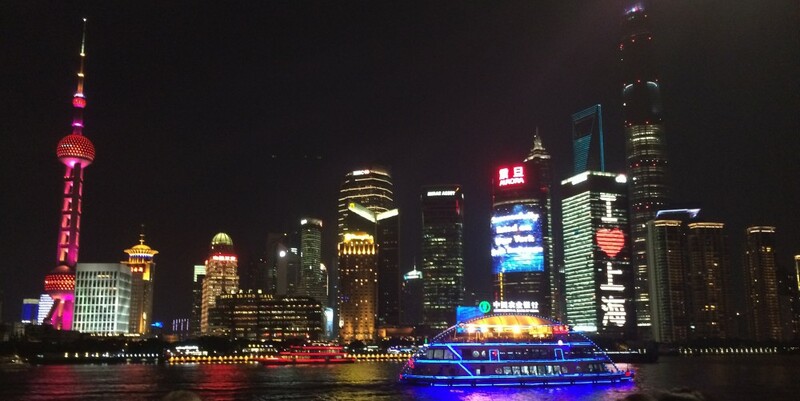 In the following days we had some memorable experiences. 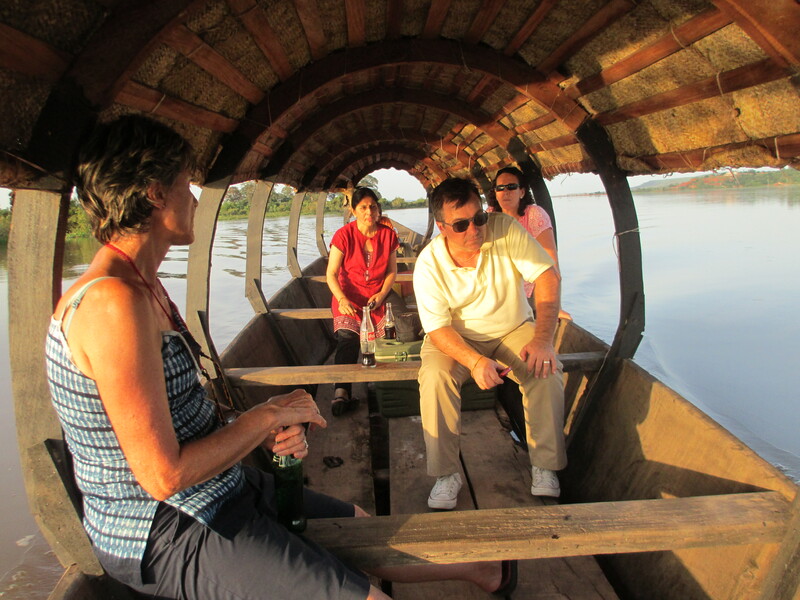 Caroline took us and a couple of other teachers on a boat ride on the Niger River, in a traditional Malian canoe (this one with a motor, I might add, which most do not have). It was so quiet out on the water, like a different world. Found out that the man-eating hippos are nowhere near Bamako. Also found out that we do not want to touch this river water. At all. Jamey and I also went alone to a clinic to get our second round of vaccinations. You just show up–no appointments necessary. Dr. Toureg was super nice, spoke English, and had a giganto fish tank in his office. The shots didn’t hurt a bit, but as before the price sure did. At least this time our new school insurance covers the cost. And finally Caroline took us to the US Ambassador’s house for drinks and later dinner at a restaurant down the way. We were joined by a coupe of US Embassy nurses and another teacher who works at our school’s satellite location, a gold mine waaaay out in the middle of nowhere. She’s from Alaska so she’s used to being far away from civilization. The Ambassador was fascinating and oh so interesting. She’s casual and funny and she plays the flute too. Who could ask for more. Our canoe had me, Jamey, the media specialist Jenny from South Africa, Caroline our director from Australia, Anka the secondary math teacher from Holland, and Sushma an administrative asst. & psychology teacher from India. Love em all! you write beautifully, I am very much enjoying “traveling” with you both. Sean and I laugh as we read your descriptions. I am very excited for your school to start…. not so much for mine to start. Thanks for the update. Everything sounds great!